I survived the night, ha! As predicted, the rain started just after 1am and lasted on and off lightly through the night. It stopped around 6am, but was still foggy and expected to return throughout the day. 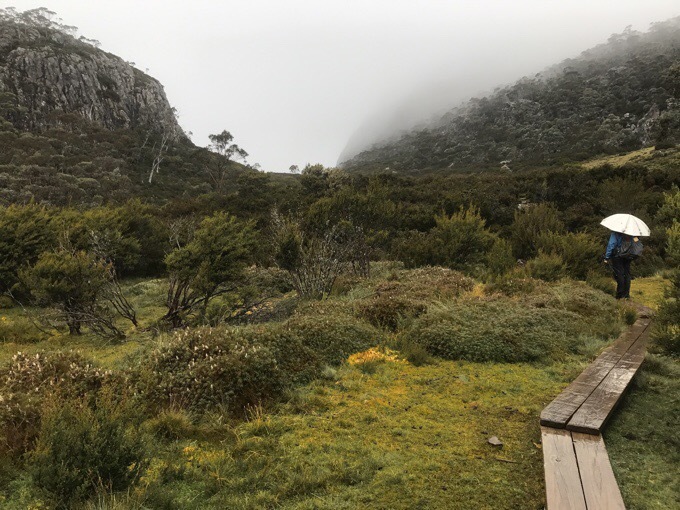 Our plan was to make it to Dixons Kingdom Hut just a couple hours from here, since it was something easy to do in rainy weather without missing views, and it set us up nicely for all the hikes in the area tomorrow when weather should be perfect. It gave us something to do this morning, and ended up being really scenic, relaxing, and enjoyable. 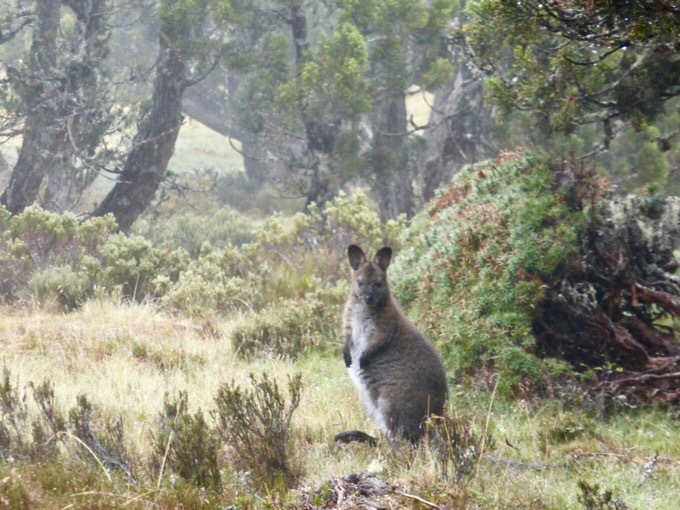 We had a lot of wallaby and pademelon sightings. I will never get enough of watching them bounce off. Griggs got the great idea of filming them in slow motion, so here’s a wallaby in action both in real time and slow motion. It’s amazing how quick the real time seems after seeing the slow motion version. Even with the low fog, the walk this morning was great! We did one of the short side trips to see Bethesda’s Pool and are saving the others for when there are clear views. 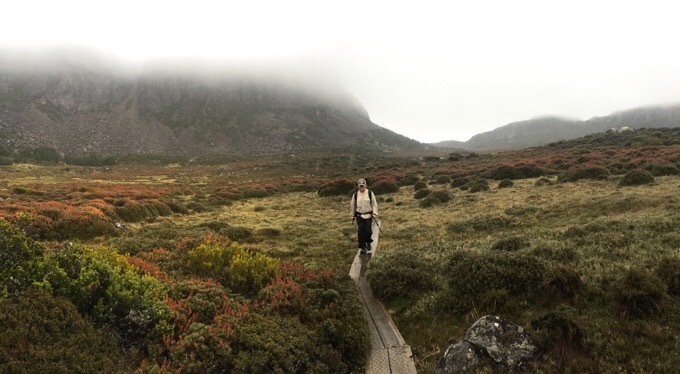 At least the fog and light rain was high enough to see the walls of rocks around us. Tomorrow, the side trips will take us up on top of those walls, and that will be fun. 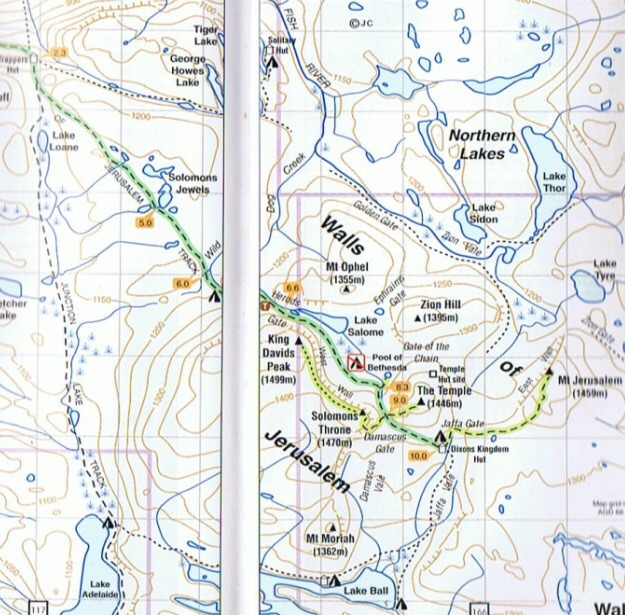 Here’s a map from one of John Chapman’s guidebooks to better visualize what we are doing. Trappers Hut is where we start, and we are headed down the green line to Dixons Kingdom. 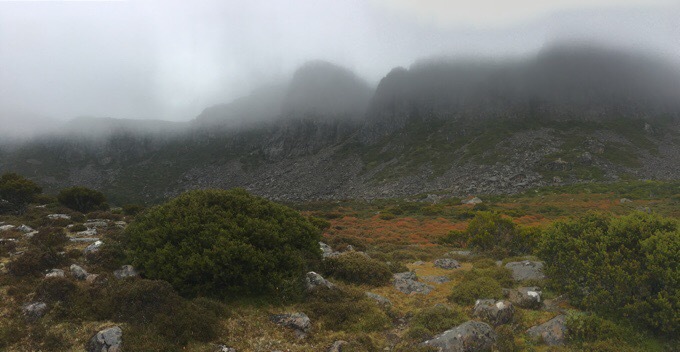 The plan today was to hang at the hut there, and hope it cleared at the end of the day to do Mt Jerusalem, then do the other side trips of The Temple, Solomon’s Throne, and King David’s Peak tomorrow before hiking back towards the OLT via Ball and Lake Adelaide (completing the loop) tomorrow. Courtesy of John Chapman’s Walls of Jerusalem guidebook. 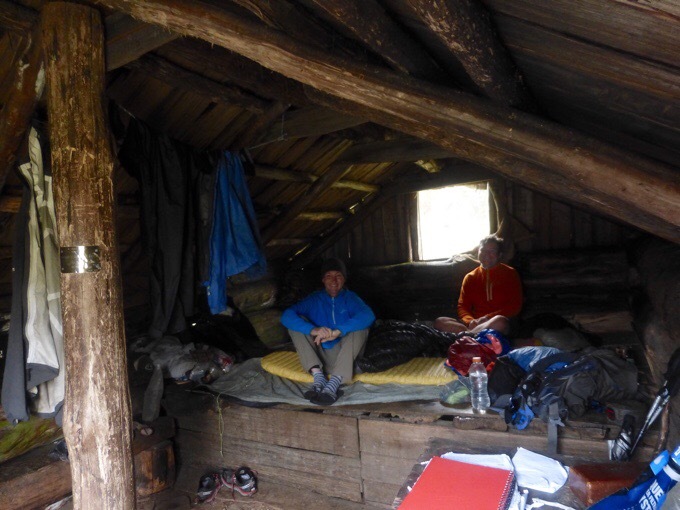 We got to the hut around 10:30am, and it was also quite rustic. Better than Trappers Hut Last night, and it began to feel quite cozy as we got settled in. 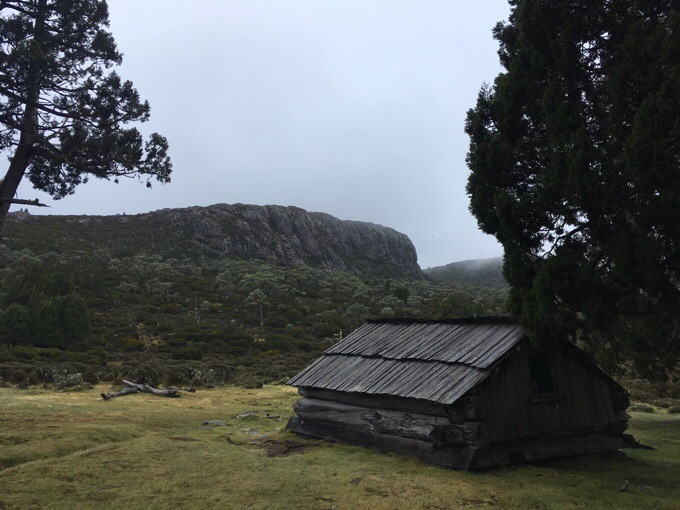 I’m still in shock that I am so comfortable sleeping in these rustic drafty huts with holes all over and the possibility of bugs and spiders anywhere. 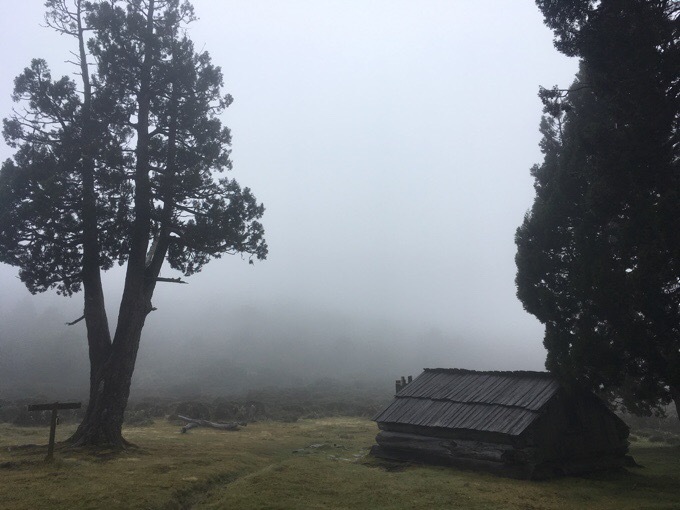 A fogged in Dixons Kingdom Hut. Around noon, two decent sized groups came through that were day hiking loops from a base camp. One of them was a group of five from a tramping club in Hobart (2hrs from the end of the Overland) that came in and had lunch with us. 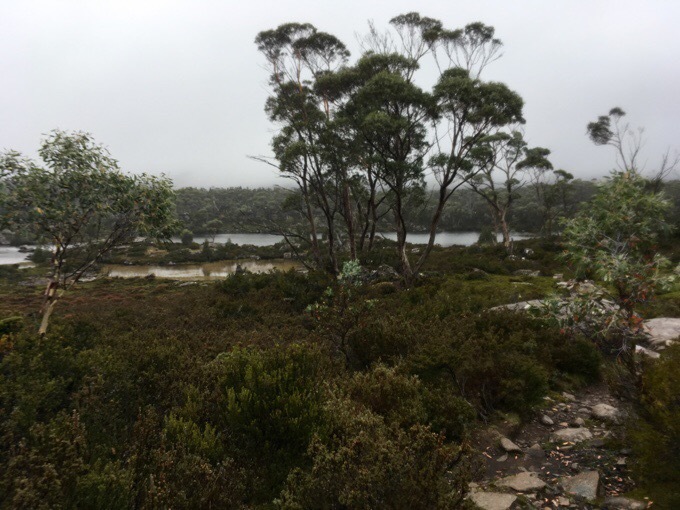 They were super friendly and gave us some great ideas and suggestions for the rest of our travels in Tasmania. After they left, we got the afternoon to ourselves. I got caught up on blogging and emails to post when I finally do get service again, while Griggs watched some of his shows. I’m so jealous he gets to watch shows every night while I blog! He also carries a bigger battery pack than I do, so he doesn’t have to conserve battery life as much as me. So jealous! Once I did finish my stuff the weather still was misty and foggy, so we watched the movie Joy that I’ve had for awhile and neither of us had yet to see. It was perfect to have a day to relax without connection to the outside world or internet, so I didn’t feel like I had anything else to do but relax. Much needed and much welcomed in our cozy rustic cabin. Our plan was to go up Mt Jerusalem just before the sun went down if it cleared enough. 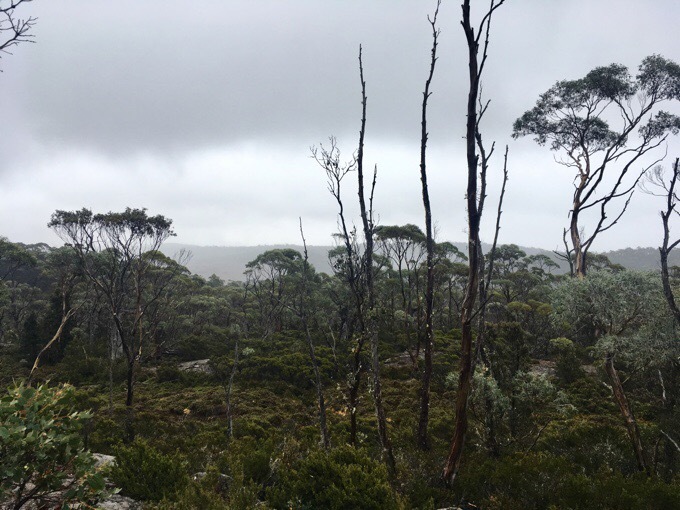 It seemed to be clearing, so we got our wet clothes and cold wet shoes and socks on to make a go at getting up there. As soon as we stepped outside, another round of mist bordering on rain started coming down. We retreated back to the sleeping bags and decided to wait until tomorrow. 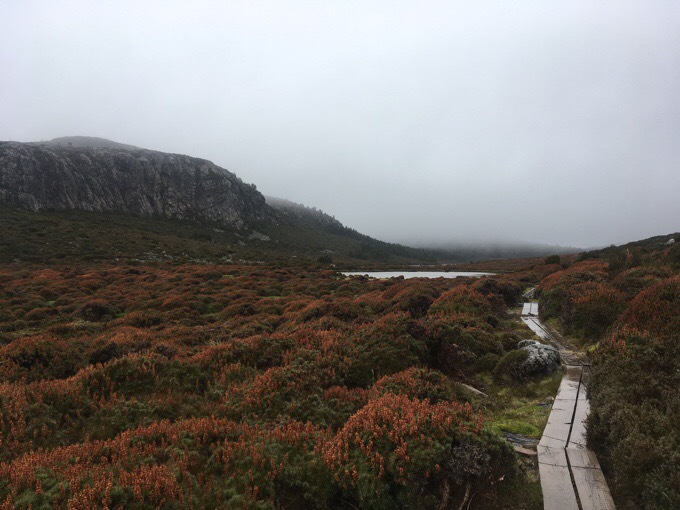 We still have plenty of time and food to hike everything we’d like so there was no need to rush it in poor visibility today. The improved views with clear skies will be well worth the wait. We finished up watching Joy, had dinner, did each of our writing for the night, and each watched an episode of something. Griggs is finishing up the most recent season of Orange Is The New Black, and this past week on the plane, I finally started watching Downton Abbey. I am possibly hooked, so I watched two episodes of that before bed. This is my type of vacation! 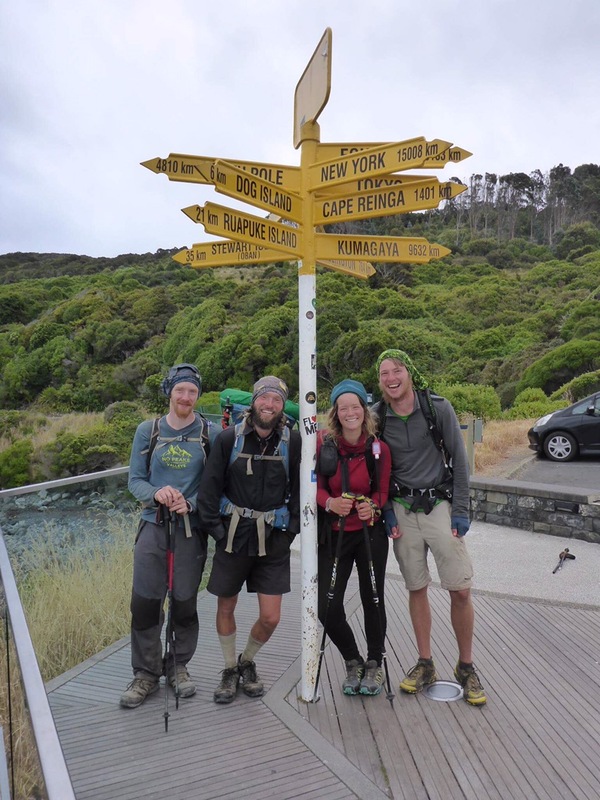 Also, for those of you that followed my Te Araroa hike, Becky and Tom finished the Te Araroa today with Heartbreaker and Tim. 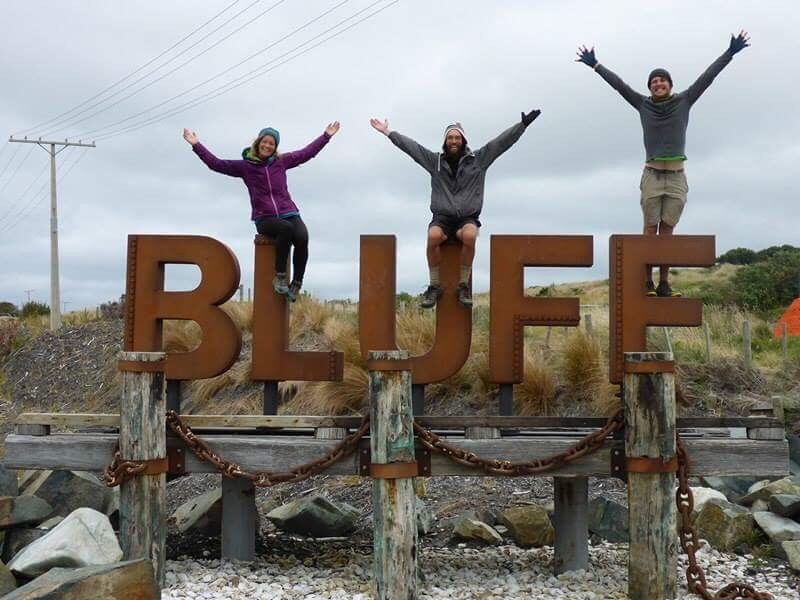 They shared some finish photos from Bluff for everyone. Yay!!! 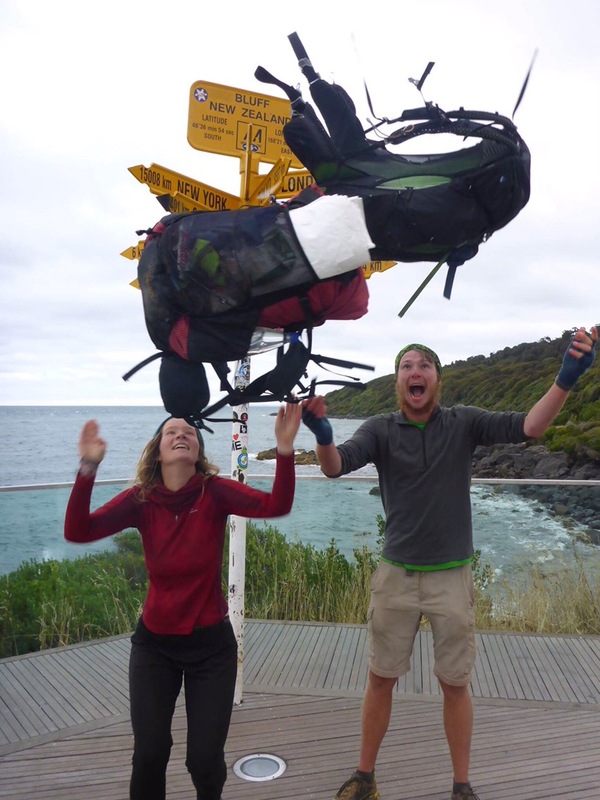 Next up, they will head just south to hike a circuit on Stewart Island and then do a bit of a road trip seeing some more of New Zealand before getting jobs to save up for a hopeful PCT hike in the next year or two. Congrats and so happy for them! Wow that weather makes the scenery look super mystical. The pool looks magical! Keep those little legs pumping & enjoy the other trips you have planned. Good to see Becky and Tom! Sounds like a nice day off, too. That is some beautiful country. The Tom & Becky “Felix Finish” photo’s are cool. It is always nice to have update on Becky and Tom and Heartbreaker and Tim. Glad you are giving Downton Abbey a go. I’d call it the best BBC production ever. It was absolutely amazing work. I was really bummed when it finished. I’m already not wanting it to end! It is six series so you’ll have a while to get into it before it finally ends. Truly great TV. I’m already halfway thru season two! I could easily watch two episodes a night at home. I think there are about 53 episodes total. What “perfectly” gorgeous photos! Amazing sights. Congrats to the finishers too…fun to see that. Oh how random! I didn’t even mention the blog did I? 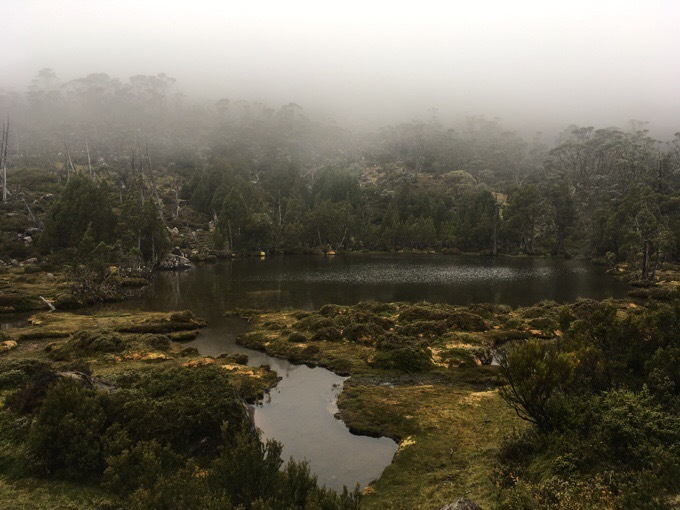 We’ve been in Hobart all day today since our bush plane to the South Coast Track couldn’t take off with all this low fog. Hoping tomorrow! So great to have you find this!